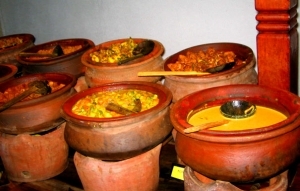 Sri Lankan cuisine is one of the most complex cuisines of South Asia. Food in Sri Lanka is normally hot and spicy. Rice is consumed daily while spicy curries are favorite dishes for lunch and dinner. Our Sri Lankan food is made on a traditional Sri Lankan kitchen which consists of a mud stove with a log fire using clay pots and wooden spoons! See and try it for yourself while you are there! You can discuss your preferred meals with us each day. Some of the Sri Lankan specialties served at The Bungalow are string hoppers (indi appa) with chicken curry (kukulmas curry), lentils (paripppu) and coconut sambal (pol sambola) or saffron rice (kaha bath) with stir fried fish (malu badhala), pickled aubergines (wambatu moju) and devilled potatoes (ala thel dhala). For those who prefer a different taste - we also serve Western dishes such as Spaghetti with Bolognese sauce, Beef steaks with chips and salad or Roast chicken with coleslaw and potatoes. For dinner or lunch we can organise a barbeque in the garden or by the pool. We can serve some local Coconut Rum (Arrack) while you enjoy a tasty barbeque under the stars. Another option for bigger groups is for you to provide your own rations and our cook will make your meals as per your choice. Please contact us in advance for more details and prices on self-catering. All our fruit and vegetables are from our very own gardens or from the local market, so they are organic and fresh! 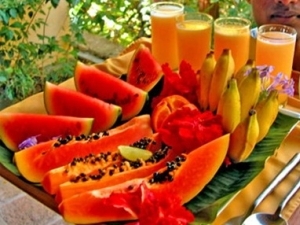 Try our yummy Red Bananas or our sweet Papayas and Mangoes from the garden. As you walk around the estate, pick Green Olives or Rambuttan from the trees!